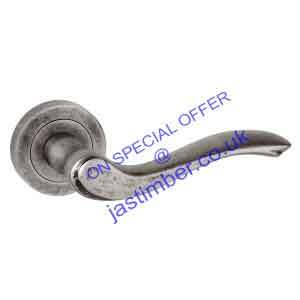 Atlantic Old English Door Handles are on Special Offer with 25% OFF! Atlantic Old English Door Handles are available to buy online, this exceptional door furniture is designed to impress. With a distinctly vintage look and feel, these handles are also ready to take on the demands of modern living. Distressed silver and matt gun metal offers an exciting aesthetic while the handle’s heavy, chunky shape is a delight in the hand. As with other Atlantic door handles from JAS Timber, you can combine our 25% discount offer with our free delivery when you spend over £75 (+ vat). ?